I pulled the rouladen (German rolling shutters) down tight before bed last night. Not to darken our rooms, but to keep the chill out. Then I woke hungry this morning–hungry for heat and sun. For summer. The rouladen were holding back the chill of a 44 degree (Fahrenheit) morning. This is liquid yum! 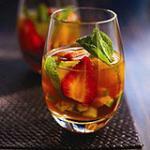 See the recipe below for a Pimms Cup. Summer has been hesitant in the Rhineland these past two weeks–she’s given in way too early to cold and wet autumn. But I’m hopeful. I’m hopeful that she’ll be back for what we southerners call Indian Summer–an unseasonably late heat wave. I’d like to be scorched, for just a few days, to complain about the heat, the sweat that begins at 7 a.m., the stifling humidity. I’d settle for a day without a jacket and for an evening on the balcony, sleeveless and sipping Pimms. The perfect summer drink–a Pimms Cup. Millions of Brits think so, and so does this one time transplant from the South. It’s not just for wedding parties or Wimbledon or the Royal Ascot. It’s pure summer deliciousness on a balmy day, OR the perfect taste of balmy-berry-sweetness-and-ginger-bite-sunshine when the day needs some reminding that it is, in fact, summertime. According to the BBC, James Pimm, a London restaurateur, began selling the elixir in the 1840’s. Within a few decades the drink had become outrageously popular. If marketing slogans can reliably note a product’s popularity, consider this slogan from the 1930’s: We had to let the west wing go, but thank heavens we can still afford our Pimm’s. Yes, we all have to have our priorities, and there are days when I might have traded my kingdom for a Pimms. . . especially if that Pimms came with a warm and sunny day attached. Pimms No. 1 is a gin based drink with an infusion of bitters and herbs. I’m not a gin girl–it’s always tasted like pine needles to me–but the magic they work on Pimms is undeniable. Over the years, other recipes have been introduced, featuring whiskey, brandy, rum, rye, and vodka. At present, only Pimms No. 1 and Pimms No. 6 (vodka based) are being produced. Mix one part Pimm’s with two or three parts ginger ale (preferably a strong ginger ale) over ice. You can mix this by the glass or by the pitcherful. I know a few folk who love a good Pimms Royal, which is a mix of Pimms and Champagne. I haven’t tried it, but if the weather ever turns back to summer here, I’ll try a spot on my balcony and then get back to you with my thoughts. Until then: Cheers! Cheerio! and Auf Weidersehen! I would love to be scorched for a few days too, that would be great! Maybe I’ll give your Pimm’s a try, I’ve never tasted it and it sounds good. Prost und zum Wohl! Vielen dank, und auch zum wohl! Another tip for German friends–someone just emailed me to say that Aldi sells a Pimms knockoff called Austins. Apparently, it’s pretty good for making a Pimms cup, although not quite as tasty as the real stuff. It’s always nice to get tips like that! Nothing like a glass of Pimms on a hot sunny day! Shame the summer has given in here too though…. Still hoping for a few blazing days here before summer throws in the towel altogether. If that doesn’t pan out, we may have to skip the Pimms and go straight to the mulled wine! I will swap with you – supposed to be over 100 degrees here Saturday – just in time for the first football game and cross country. We’re going to hear Phillip Phillips tomorrow night – think I will break out the Pimms! Oh, I’d love to hear Philip Phillips. Have fun! Too bad you can’t just loan us a few of those extra degrees–absurdly cold here the last few days. Thanks! Yes, Pimms is a revelation!